If you’re looking for a little extra privacy for your spa, or just a place to relax in the shade, a canopy gazebo or enclosure is a great idea. In Georgia, gazebos offer you the ability to use your spa year round while protecting it from the elements. It’s also the perfect setting to enjoy a meal with the family outside yet away from the heat of the sun. As a Gazebo Works Too dealer, Crystal Clear Pools carries the complete line of luxury redwood gazebos and enclosures. We can assist you in choosing and installing your Georgia gazebo to make it a true part of your beautiful backyard. To explore the possibilities or to see where a canopy gazebo will fit into your backyard retreat, contact us or visit us at one of our retail locations. 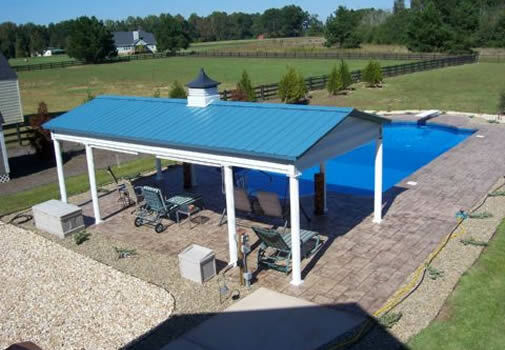 We provide pool enclosures in the following Metro Atlanta counties and cities.